If you’re driving and staying somewhere for any length of time, it is essential to know how much money is being spent. If you’re paying for the trip yourself, this calculator will warn and maybe prevent you from going over-budget. If you’re getting reimbursed from a client or employer, this calculator will be sure everything is accounted for. In short, this travel expense calculator will help you save money. 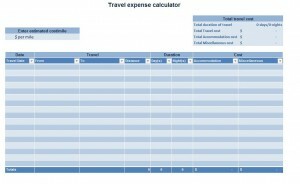 The travel expense calculator calculator is a free template for Microsoft Excel and can be customized to suit your needs. By default the template has room for up to seventeen trips, but this can easily be expanded with a few button clicks. The template can be downloaded quickly and is very easy-to-use… you’ll simply enter in the requested information and the template will present you with a basic report, in real-time, outlining the total travel costs associated with your trip. Download the free, easy-to-use travel expense calculator from this website and open it in Microsoft Excel. Determine and enter an appropriate estimated cost per mile. Consider things like the price of gas along your route and the estimated “wear and tear” on your vehicle. Enter a travel date in the first column, the locations traveled to and from in the second and third columns, and the distance (in miles) between the two in the fourth column. In the remaining columns, enter your stay duration, the dollar amount of your accommodations, and any other miscellaneous costs. Your “total travel cost” will be calculated taking everything into account and will be reflected in the table located in the upper right. Save or print the completed template for future use. Do NOT edit the “Total travel cost” table, located in the upper right corner. These are your results and will fill in automatically as you enter data into the rest of the spreadsheet. Distance is measured in miles. This comes in handy when keeping track of your own expenses to balance your checkbook, for tax purposes, or requesting reimbursement.